UUVs to be Equipped with Nuclear Capabilitieshttps://i-hls.com/archives/88349, Jan 20, 2019 Russia has been making efforts to advance a nuclear-powered unmanned underwater vehicle program. The Russian Navy plans to place more than 30 Poseidon strategic nuclear-capable unmanned underwater vehicles (UUVs) on combat duty. “Two Poseidon-carrying submarines are expected to enter service with the Northern Fleet and the other two will join the Pacific Fleet. Each of the submarines will carry a maximum of eight drones and, therefore, the total number of Poseidons on combat duty may reach 32 vehicles,” tass.comreported. The special-purpose nuclear-powered submarine Khabarovsk currently being built will become one of the organic carriers of the Poseidon nuclear-capable underwater drone, according to defenseworld.net. Also, special-purpose submarines and Project 949A nuclear-powered underwater cruisers operational in the Russian Navy may be used as the carriers “after their appropriate upgrade”. In March 2018, Russian President Vladimir Putin mentioned for the first time the country’s efforts to develop a nuclear-powered unmanned underwater vehicle that can carry both conventional and nuclear warheads and is capable of destroying enemy infrastructural facilities, aircraft carrier groups and other targets. Sea trials of the Poseidon commenced in December 2018. The ongoing tests are part of experimental design work rather than full-fledged sea trials, according to a Russian defense industry source. Russia’s Rosatom wins two bids for accident management at Fukushima NPP http://tass.com/world/1039631, January 12, 2019, MOSCOW, Russia’s state nuclear corporation Rosatom has been engaged in the nuclear control plan at Japan’s stricken Fukushima nuclear power plant and has already won two bids in that project, Rosatom CEO Alexei Likhachev said in a televised interview with Rossiya’24 news channel on Saturday. “We have been engaged by Japan to implement the nuclear accident management plan at the Fukushima NPP. We have won two tenders and are getting ahead,” he said. It is two hours past midnight on August 2nd 1987 when the Soviet nuclear weapons scientists push the button triggering a series of five nuclear devises inside a tunnel at the Matochkin Shar nuclear testing site. A load boom follows and the ground is shaking like an earthquake. A huge dust cloud blows out from the tunnel supposed to be hermetical sealed by meters thick stone- and concrete walls. The radioactive dust cloud came as a big surprise to the personnel witnessing. Now, more than 30 years later, a photo from the accident is published by Russian blogger who focuses on nuclear thematic and also posts photos on twitter. Leakage of radioactivity from the August tests in 1987 is known from before, listed in a 2005 publication by Science and Global Security. Now, the photo from the site gives the public a better understanding of the size of tunnel collapse. The photo is taken no more than a kilometer from the tunnel entrance and shows a military helicopter parked in in front. Each of the tunnels in the area where underground nuclear weapons testing took place from 1964 to 1990 has its own code number. The one collapsing on this photo is known as tunnel A-37A. According to a list of all underground nuclear weapons tests at Novaya Zemlya, published by Science and Global Security, the total yield of the five devises exploded on August 2nd were 150 KT, ten times the size of the bomb dropped on Hiroshima in 1945. The leakages of radioactivity was estimated to 56 TBq. The gamma radiation near the entrance to the tunnel was measured to more than 500 R/h. First radioactive gases were detected 90 seconds after the blast. 500 R/h is about 1000 times the annual dose for an average human. Exposed directly, such dose could be lethal within an hour or two. The authors describe how an emergency program was immediately instituted evacuating all staff within a period of a few minutes. No cases of radiation sickness occurred amon the test site personnel at Novaya Zemlya. Mountian Moiseev, where the nuclear weapons tests took place, is located about 10 kilometers south of Severny, the military settlement on the shores of the Matochkin Shar serving as the centre for the nuclear test site. The last real nuclear weapon test at Novaya Zemlya took place on October 24th 1990. Today, only subcritical nuclear weapon tests are conducted on the Russian Arctic archipelago. Perhaps the most terrifying was a Cold War doomsday system that would automatically launch missiles—without the need for a human to push the button—during a nuclear attack. But the system, known as “Perimeter” or “Dead Hand,” may be back and deadlier than ever, by Michael Peck , 9 Jan 19, If Russia is now discussing Perimeter publicly, that’s reason for the rest of us to worry. Russia has a knack for developing weapons that—at least on paper—are terrifying: nuclear-powered cruise missiles, robot subs with 100-megaton warheads . But the system, known as “Perimeter” or “Dead Hand,” may be back and deadlier than ever. Zvezda: “Will we have time to answer if the flight time is reduced to two to three minutes when deploying medium-range missiles near our borders? In this version, all hope is only on Perimeter. And for a retaliatory strike. Or was Perimeter also disassembled for parts? There have been cryptic clues over the years that Perimeter still exists. Which illustrates one of the curiosities of this system, which is that the Soviet Union kept its existence secret from the American enemy whom it was supposed to deter.What is unmistakable is that Perimeter is a fear-based solution. Fear of a U.S. first-strike that would decapitate the Russian leadership before it could give the order to retaliate. Fear that a Russian leader might lose his nerve and not give the order. RUSSIAN ministry of defence officials have hinted that a new underwater nuclear warhead-carrying drone is impossible to detect. By Douglas Patient / 5th January 2019 Dubbed President Vladimir Putin‘s new secret weapon – it’s even more deadly than originally thought according to Russia. The navy will be armed with Poseydon drones as soon as 2027. It carries nuclear warheads and was created in order to obliterate enemy ports. But being equipped with warheads of 100 megatons, it can also be used against coastal cities. Attacks would involve detonating the warhead underwater, creating huge tidal waves up to 1,640ft high. At the same time it would contaminate enemy territory with radiation. Unlike conventional nuclear weapons it would also be immune to being hit by missiles, lasers and railguns. The concept of the strategic underwater drone named Poseydon was first put forward in 2015 and mentioned by Putin in March last year during his state-of-the-nation speech. It was initially believed that the Poseydon will be able to travel up to 70 knots, which is about 80mph, while underwater. But now it has been confirmed that the sample actually be capable of travelling as fast as 125mph (more than 110 knots). In an official statement ministry said: “The drone will travel to its destination at a speed of 200 kph (125mph) and a depth of 1km (0.6 miles). The drone will be moving in a so-called ‘air-cavern’ (a process in which a steam filled bubble forms around the drone, which reduces the resistance of the water and allows it to move so fast). Officials also released a video showing the computer presentation of Poseydon drones from the Russian Ministry of Defence. This comes as Russia said it was developing a drone sub that has an underwater rifle to fire at enemy divers. Putin puts shipping safety regulation in the Arctic into the hands of the nuclear industry! Rosatom has officially been granted the leading role in the development of the vast Russian Arctic. The company that employs more than 250,000 people and engages in a multitude of activities related to nuclear power development and production is now formally Russia’s management authority for the Northern Sea Route. The law was adopted by the State Duma on the 11th December and on the 28th signed by Vladimir Putin. The new legislation comes as Russian Arctic shipping is on rapid increase. In 2018, about 18 million tons of goods was transported on the sea route, an increase of almost 70 percent from 2017. And more is to come. According to Vladimir Putin so-called May Decrees, the top national priorities, shipping on the Northern Sea Route is to reach 80 million tons already by year 2024. Rosatom’s new powers in the Arctic include development and operational responsibilities for shipping, as well as infrastructure and sea ports along the northern Russian coast. The responsibilities of the Northern Sea Route Administration, that until now has operated under the Ministry of Transport, will now be transferred to Rosatom. It was Putin himself who in early 2017 made clear that a coordinating government agency for the Northern Sea Route was needed. A battle between Rosatom and the Ministry of Transport followed. In December 2017, it became clear that the nuclear power company had won that fight. 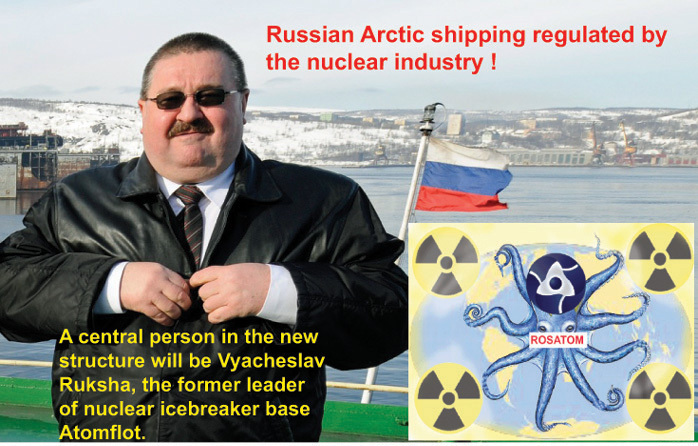 A central person in the new structure will be Vyacheslav Ruksha, the former leader of nuclear icebreaker base Atomflot. The nuclear power company has since 2008 operated the fleet of nuclear-power icebreakers. Currently, five icebreakers are based in Atomflot, Murmansk, and several more ships are under construction, including four powerful LK-60 vessels. Rosatom is also in the planning process of the «Lider», the 120 MW capacity super-powerful ship that can break through two meter thick ice at an unprecedented 10-12 knot speed. US could withdraw from a second treaty while Vladimir Putin’s Russia promises a new generation of nuclear weapons The decision on whether or not to destroy the world came down to a humble Soviet duty officer early one morning in 1983. Stanislav Petrov was told by his computer that the United States had launched at least five intercontinental ballistic missiles at the Soviet Union, and that they would strike in just 25 minutes.Rather than send the alarm up the chain of command, the lieutenant colonel did nothing and averted a nuclear clash over what turned out to be a systems malfunction. For his troubles, Petrov was reprimanded for failing to keep careful notes during the incident and left the service the following year. He died at 77 just last year, on the cusp of the collapse of the architecture that has governed nuclear arms control for the last two generations. Potential nuclear clashes may seem the stuff of Cold War lore, but the framework to prevent them is recent and increasingly endangered. Led by National Security Advisor John Bolton, the United States in 2018 said it would leave the Intermediate-Range Nuclear Forces Treaty, the 1987 nuclear arms control treaty largely credited with keeping nuclear weapons out of Europe. That came after years of complaints about Russia testing a ground-based cruise missile that violated the treaty. The next pillar to fall could be the New Start treaty, signed by Barack Obama and Dmitri Medvedev in 2010, which reduced strategic missile launchers by half. That treaty will expire in 2021 unless it is extended, and President Trump has called it a “bad deal” in a telephone call with Vladimir Putin. Putin also threatened the United States with a new line of nuclear-capable weapons earlier this year, blaming the United States’ decision to exit the 1972 anti-ballistic missile treaty for a new arms race. His state of the nation speech, usually a staid affair, was accompanied by a low-resolution animation of a nuclear-powered cruise missile sailing from the Atlantic Ocean, around Cape Horn and then northward toward California. Taken together, these treaties are the bulk of the nuclear arms control framework that the United States and Russia inherited from the Cold War or have developed since. Experts from both sides note that the treaties weren’t perfect but warn that brokering deals is far more difficult than breaking them. The probability of an arms buildup is growing. “The INF decision and failure to get into real discussions about extending New START has us sleepwalking into a new nuclear arms race,” said Richard Burt, a former ambassador who served as chief negotiator for the United States on the Strategic Arms Reduction Treaty, during an Atlantic Council event earlier this year. Viktor Yesin, the former chief of staff of the Russian Federation Strategic Missile Force, said that the US decision to exit the INF was largely with an eye to military developments in China and other countries not bound by the treaty. But the decision could lead to deployments of missiles in Europe, he said, unless the United States and Russia take steps to avoid it. Only “political measures” could avert “the worst outcome for Russia and Europe in the development of a ‘missile crisis,’ which will unavoidably arise after the United States exits the INF,” he said. Those warnings appear to be apt. 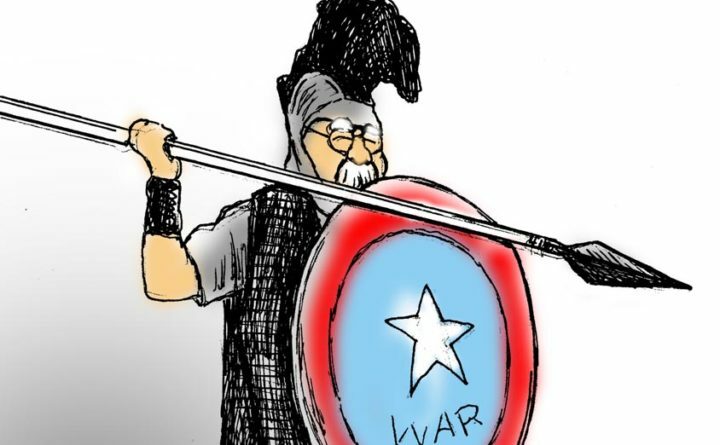 A leaked memo published by the Washington Post showed that Bolton had ordered the Pentagon to “develop and deploy ground-launched missiles at the earliest possible date.” The order was tabled only after European allies intervened to prevent an immediate US pullout from the INF. Washington has issued Moscow a 60-day ultimatum, after which it will exit the treaty. Russia, which has not admitted to violating the treaty, has signalled it won’t change its behaviour. The driving force behind the pullout is seen as Bolton, who has spoken fervently against similar arms control treaties and presided over the demolition of both the anti-ballistic missile treaty in 2001 and now the INF. Determined individuals can change the course of history. In 1983, Petrov’s decision not to alert his superiors came down to a “funny feeling in my gut.” Now, Bolton appears resolved to finally see a United States released from the bonds of missile treaties and nuclear arms control. By: The Associated Press MOSCOW — Russia wants to sit down with Pentagon officials for “open and specific” talks on alleged violations of the Intermediate-Range Nuclear Forces treaty, the Russian Defense Ministry said Saturday. Landmark nuclear treaty can still benefit US, NATO and Russia security. They should delay action for six months and negotiate ways to show compliance. The Intermediate-Range Nuclear Force Treaty — a key part of the post cold war nuclear system of controls and restraint — is on life support. President Donald Trump announced his desire to withdraw from the 1987 INF pact in October, citing Russian cheating and a desire to deploy missiles against China as motives. German Chancellor Angela Merkel reportedly convinced Trump this month to hold off on withdrawal for at least two months so the NATO alliance could act in a more united fashion to either bring Russia back into compliance or show it was trying. There’s no doubt that Russia violated INF Treaty The INF Treaty signed by President Ronald Reagan and General Secretary Mikhail Gorbachev bans the US and Russia from having land-based missiles with ranges from 500-5500 kilometers. The Treaty helped end the cold war and paved the way for reductions in strategic nuclear weapons. Banning these weapons gave leaders in Russia, Europe and America more time to make decisions in a crisis, and the treaty is worth saving if all sides can show there are fully complying with the deal. There is no real question that Russia has violated the INF treaty. The United States has been sure of this since 2013 and has been increasingly clear about how Russia has violated the deal. Russia tested its 9M729 cruise missiles from a mobile fixed launcher to a distance of over 500 KM — something allowed by the treaty — and then later tested the same system from a ground-mobile launcher, making the missile a ground-launched system under the terms of INF. Russia denies the 9M729 missile violates INF and instead accuses the United States of violating the INF by deploying the Mark-41 missile launcher as part of NATO missile defenses in Europe. The Mk-41 on shore is used to launch missile defense interceptors, but is used by the U.S. Navy on ships to launch offensive missiles. Russia claims this violates INF. Washington says the Mk-41 launcher for NATO’s defense is physically capable of holding canisters to launch offensive missiles like the Tomahawk cruise missile, but the land-based variant deployed in NATO is not equipped with firing software. Washington claims this makes the launcher legal, but this explanation gives Moscow little comfort. For five years, the two countries have tried to get the other to admit their violation. That approach has failed and the treaty is now at risk of disappearing. The only way to save it — something both countries say they want — is for both to go beyond what the treaty requires to assure the other that it is in compliance. Over the last year, former officials and experts from Russia and the United States have met privately to explore what an extra transparency regime might look like. Russian former military officials have said that the 9M729 should be made available for both inspection and even taken apart for American inspectors to determine if it can travel over 500km. While not an official Russia government offer, it seems unlikely that former officials would suggest such a thing without a sense that it might be possible. Former American officials, for their part, have said NATO missile defense sites could be made available for visits by Russian officials to show no offensive missiles deployed on site. Other more extreme steps might be to modify the Mk-41 launcher so that it cannot physically hold or launch offensive missiles. This deal is worth official exploration. Trump and Russian President Vladimir Putin should pledge not to take any unilateral steps on the INF Treaty — including withdrawal — for at least six months. They should send senior officials from their militaries, the State and Defense departments, and the White House and Kremlin to negotiate on a continual basis to see if such a deal is technically feasible. The teams should be directed to produce a draft deal for both presidents and for NATO — whose security is most at risk and whose members will need to agree to steps providing transparency over NATO missile defense sites — in three months for official consideration. Trying to save the INF treaty can have important benefits for the United States and its NATO allies. Now that the US has publicly released details of Russia violations, European NATO states may be able to bring more pressure on Russia to come back into compliance. If in the end, Russia’s violations cannot be reversed, making these efforts will show it is a lack of political will, and not technical problems, that led to the treaty’s demise. This will in itself help NATO allies as they wrestle with how to manage security and stability in a post-INF world. Treaties should only remain in force if they benefit American and allied security, and sometimes treaties outlive their usefulness. But the INF still can protect these interests, and Russian security as well, if all sides are prepared to show that they remain in compliance. Richard Burt is for the former ambassador to Germany and led the 1991 START Agreement talks. Ellen Tauscher is the former undersecretary of state for arms control and international security and oversaw negotiation of the New START Treaty. Both are members of the Nuclear Crisis Group based in Washington. Viktor Yesin, who commanded Russia’s Strategic Rocket Forces in the 1990s, spoke of Perimeter/Dead Hand during an interview last month in the Russian newspaper Zvezda [Google English translation here]. Yesin said that if the United States starts deploying intermediate-range missiles in Europe, Russia will consider adopting a doctrine of a preemptive nuclear strike. ……..
Milos Mostecky, vice president of Rusatom Overseas, highlighted the vast experience of ROSATOM in engaging local suppliers while projects implementation abroad. “We are confident that Saudi companies are ready to take part in large-scale projects in power sector. Our Saudi partners are willing to participate in NPP construction in Saudi Arabia and think highly to perspective of cooperation with Rosatom,” Mostecky added. In June 2018, ROSATOM was shortlisted to the next stage of competitive dialogue on Saudi Arabia’s first nuclear power project.